« McMahon destroy’s Blumenthal in debate: Maybe you misspoke again! “Summer of Recovery” Economic News Roundup! – UPDATED! Stay tuned – more updates coming to this post soon! The White House told us this would be the “Summer of Recovery” so how did it go? The elite media has been telling us that each and every month of woeful economic news has been “unexpected” or a “surprise” since shortly after Obama took power. Finally the canard is off and he elite media is running to catch up when the train has already left the station. For previous posts check out our Econ 101 and Energy & Taxes categories! The U.S. economy lost 95,000 jobs in September, far worse than expectations for no change in employment. More Census-related temp jobs ended, as expected, but state and local governments slashed staff far more than predicted. Employment bottomed in December 2009 at 129.588 million — two years after peaking at 137.951 million. At this year’s pace, the U.S. won’t recoup all those 8.36 million lost jobs* until March 2020 — 147 months after the December 2007 high. The U.S. needs to create 125,000-150,000 jobs each month just to absorb new workers and prevent unemployment from rising. So returning to the old peak employment a decade later would hardly suggest a healthy labor market. 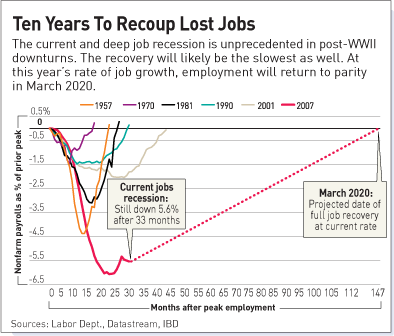 The bottom line: It’s quite possible that the next recession will hit before the U.S. returns to old employment highs [this means double dip recession very likely as we have predicted since march 2009. – Editor]. AP: Unemployment has now topped 9.5 percent for 14 months in a row, the longest stretch since the Great Depression of the 1930s. UK Guardian: Indiana still awaits Obama’s promised green recovery. More than a year after the president visited to announce a new era of green jobs, the grant he promised has not materialised and unemployment is high. The recession put a 3.1 percent dent in the personal incomes of New York state residents, who endured their first full-year decline in more than 70 years, according to a report released Tuesday. Paychecks or net earnings tumbled 5.4 percent, while dividends, interest and rent slid 8.4 percent, to a grand total of nearly $908 billion, the state comptroller’s report said. Not only did New Yorkers’ personal incomes fall “almost twice” as much as they did in the nation as a whole, but they have yet to recover to pre-recession levels, Comptroller Thomas DiNapoli said. GE owns NBC and MSNBC – is it any wonder that they are completely in the tank for Obama and have the most left wing bias in the entire elite media? The number of Americans receiving food stamps rose to a record 41.8 million in July as the jobless rate hovered near a 27-year high, the government said. Recipients of Supplemental Nutrition Assistance Program subsidies for food purchases jumped 18 percent from a year earlier and increased 1.4 percent from June, the U.S. Department of Agriculture said today in a statement on its website. Participation has set records for 20 straight months. An average of 43.3 million people, more than an eighth of the population, will get food stamps each month in the year that began Oct. 1, according to White House estimates. AP: Consumer confidence drops to lowest since Feb.
Goldman Sachs Group Inc. said the U.S. economy is likely to be “fairly bad” or “very bad” over the next six to nine months. BLS: Youth Unemployment at record high 19.1% since statistic has been measured since 1948. WSJ: Stock Market Logs Worst August in 9 Years. LA Times: Jobs aren’t coming back. Unemployment likely to stay high. Reuters: Economic Growth Expectations Adjusted Downward – Our friends at HotAir had some fun with this report from Reuters saying “Reuters economists expect even more of the ‘unexpected’ next year”. Reuters: Banks foreclosed on 102,134 properties in September, the first single month above the century mark. This entry was posted on October 13, 2010 at 01:07	and is filed under 2012, Chuck Norton, Corporatism, Economics 101, Energy & Taxes, Is the cost of government high enough yet?, Obama and Congress Post Inaugration. You can follow any responses to this entry through the RSS 2.0 feed. You can leave a response, or trackback from your own site. So here we are, only months after the Economic “Stimulus” Package the majority of American’s knew was a terrible idea. Rather than represent their voters, they shove it down our throat. Now that we have spent ourselves into a hole, we begin to see all the tell tale signs of completely undermining our own authority in the world. Our economy is losing it’s reputation and our ability to push economic agenda worldwide is observed with scrutiny. The majority of American’s knew, if not by their own logic, in their gut, that this spending spree was a terrible idea. Of course, they are shown to be right. A Trillion dollars later, we’re wishing we were back where we started – at least then we would be a trillion dollars ahead in our debt with the same results. I can’t wait to do some firing in November myself, I have full expectations that The Vision will be doing something to help me in my voting decisions… a sort of voter guide if you will… At least that would be my request. I don’t have enough time in my busy schedule to dig up the dirt on these guys. Everyone knows we are stuck voting for the least dirty. Great article, as usual, Chuck. This is the one good thing about the GOP getting booted from office in 2006 and 2008. Most of the old guard Republican Party was either voted out in the last two elections or replaced by Tea Party candidates in the recent primaries. There is a great deal of new blood. The Republicans are likely to sweep the next two elections. The American people are going to give the new blood Republicans a chance. Unlike any election in my lifetime the Republicans are going to have a group of people with a clean slate and the party must understand that they had better perform or the voters wrath is going to get ugly. In the 2006 and 2008 elections the Democrat Party “new blood” was handed total power in DC with a working filibuster proof majority in the Senate. The Democrats could do anything they wanted and all that Democrat new blood showed us that the moderate to traditional rhetoric they used to get elected was a lie. Not only did they govern to the far far left; they have used payoffs, passed corrupt legislation to pick winners and losers, and have spent like crazy and steered it largely to their political allies. Now we are seeing in this election that the Democrats are willing to lie, edit and splice video to make Republicans appear to say things they did not and just make up allegations against their Republican opponents at a degree that I have not seen in my lifetime.